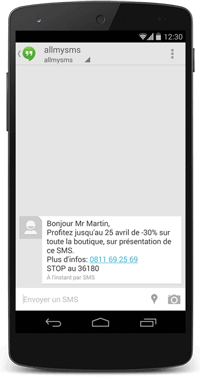 Connected to more than 700 operators worldwide, AllMySms allows you to send SMS in France and abroad. We guarantee the best SMS service at the lowest market prices, without any commitment. Choose AllMySMS.com for your bulk SMS sendings, manage your SMS alert systems, SMS marketing campaings or to stay in touch with colleagues and partners via SMS. Choose our API http, FTP or our SOAP Web Service to send SMS from your system information. And travelling, you will always have access to your account via our Allmysms Android application or our Responsive Design SMS mobile site. SMS is the only medium that has an open rate of 90% in 15 minutes!